Introducing you to the exciting world of handmade Oriental area rugs - a world of timeless beauty and cultural mystique that has remained virtually unchanged for centuries. The information offered here provides the reader with both a general understanding of the origin and the creation of an Oriental rug, as well as some of the advantages of including these handcrafted rugs in your decorating plans for your home, office, or wherever a floor covering is needed. While a variety of weavings are mentioned in ancient writings, the origin of handwoven Oriental rugs is uncertain. The earliest surviving piece, known as the Pazyryk carpet, dates back to about 400-500 B.C. Discovered in a burial site excavated in southern Siberia in 1947-49, it is now part of the Hermitage Museum Collection in Leningrad. Dramatic changes have occurred in today's handmade Oriental carpet industry. Although weaving techniques and traditions have remained virtually unchanged, the weavers have found it more advantageous to adapt designs and colors to better satisfy Western decorative tastes. Moreover, throughout the 1980s, the production of Persian-design carpets in other countries, particularly India, China, Pakistan, and Rumania has increased significantly, offering consumers an ever-wider range of color and design choices available in a full range of prices. Although some of the special techniques involved in weaving an Oriental rug may vary from country to country and even from one region to another, the principles of rug-making - from dyeing the yarn to shearing the finished piece - are virtually the same throughout the world and have changed very little over the centuries. Still, a basic understanding of an Oriental rug's construction will be invaluable to you when selecting an Oriental rug. By and large, most Oriental rugs feature a wool pile, mainly derived from sheep, whose quality depends on factors such as the animal's breed and diet, local climate, and shearing season. After shearing, the wool is washed, carded (i.e., a teasing process that straightens the fibers), and then hand - or machine - spun into yarn. Next, the yarn is dyed in an attractive range of colors and then dried slowly in the sun. After the wool has been spun into yarn it is dyed. 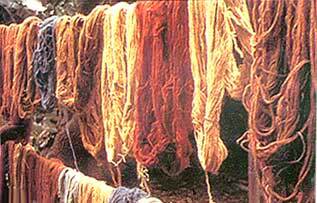 After being dyed, the yarn is dried slowly in the sun. A detailed illustration of the carpet design, most commonly called a cartoon, guides the weavers throughout the entire rug-making process. The design is rendered on graph paper to scale. graph paper, is the weaver's guide throughout the entire weaving process. Through the ages, looms have remained relatively unchanged. While the most primitive is the nomadic or horizontal loom, the type most generally used today consists of two vertical beams of either wood or metal and two similarly made horizontal beams. The distance between the vertical beams determines the rug's width. 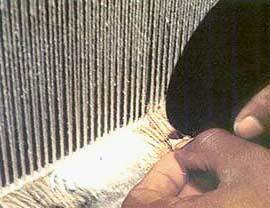 Warp threads, usually cotton, are strung between the horizontal beams at a consistent tension. The thickness of the warp threads and the closeness at which they are strung are two of the elements that will determine the fineness of the weave (i.e., knot density) of the carpet that is ultimately woven. There are two types of knots used in rug-weaving: the Turkish knot (also called Ghiordes or symmetrical knot) and the Persian knot (also known as Senneh or asymmetrical knot). With the average weaver able to tie 10,000 to 14,000 Turkish or Persian knots a day, several weavers working together can only complete one or two inches of the carpet a day. The weaver ties a knot around two adjacent warps, slides it down to the base of the weft and cuts the yarn with a knife. This procedure of tying and cutting creates the pile of the rug. Before the actual knotting of the pile begins, the rug is secured at the bottom of the loom by a short kilim, a flat pileless fabric, which is woven by passing several rows of horizontal cotton threads, or wefts, through alternate warp threads. After rolling the different-colored yarns to be used into balls, the weaver, reading the design from the cartoon begins weaving the rug. 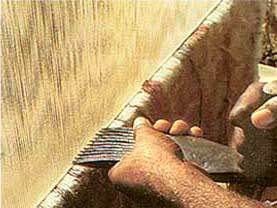 With the appropriate color yarn, the weaver ties a knot around two adjacent warps, slides the knot down to the base of the weft, and then cuts the yarn with a knife, thereby producing the pile. After each row of knots is completed, one or more weft threads are inserted to secure the knots and are beaten down tightly with a comb. At this stage, the pile ends are often cut level with a pair of shears. 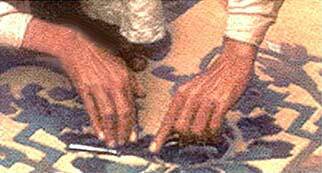 The alternation of wefts with rows of tied knots is repeated until the carpet is finished. Before removing the rug from the loom, another kilim is woven at the top. The fringe is formed by the cutting of the warps at both ends of the rug. After the rug has been cut off the loom, the final finishing steps take place. First, the selvedge edges (i.e. side edges of the rug formed by the continuous weft) are bound or overcast with yarn to reinforce the side edges of the rug. Next, the warp ends, which secured the rug to the loom, are knotted or braided to form the rug's fringe. 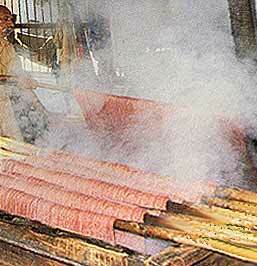 The rug is then washed either by hand or by machine to eliminate dust and dirt that accumulated during weaving. In addition to cleaning the rug, the type of wash given the rug can also impart an exquisite sheen and luster to the wool as well as soften or antique the rug's colors. After the side edges of the rug are overcast and the fringe has been knotted the rug is washed. On certain carpets motifs are accented by carving or incising. 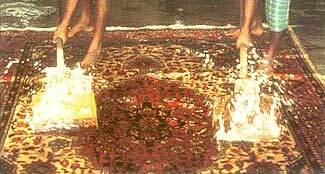 Once the rug is washed and dried, a carpet cutter shears the tops of the knots to create a uniform pile height. In addition to the surface shearing certain carpets feature carved or incised designs which highlight various motifs. Today, this type of accenting is often done to Chinese, Indian, and Turkish carpets. The Oriental rug is now completed and ready for shipment. loom and the surface is sheared to create a uniform pile height.